Nothing screams summer holiday celebration quite like a BBQ. 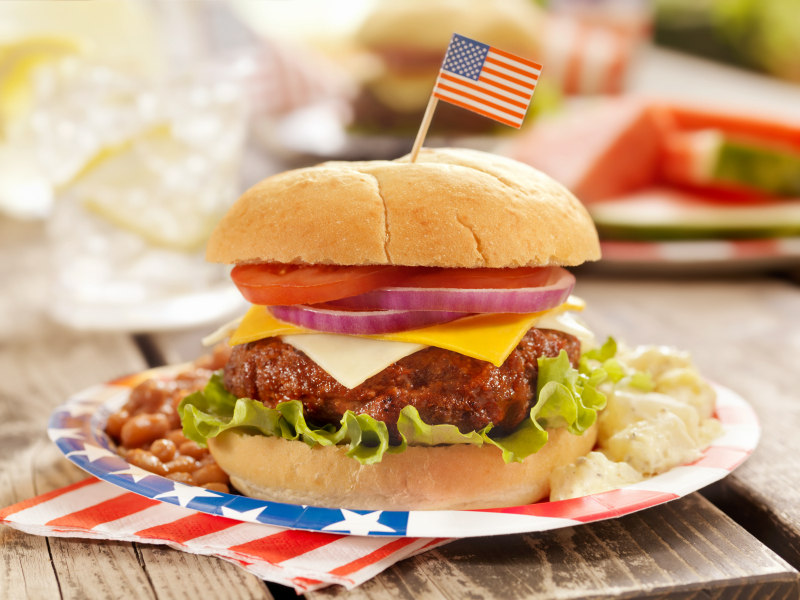 Whether you’re firing up your own grill or the guest at a backyard, beach or poolside party, the good news is there are ways to enjoy the food and fun and not hate yourself tomorrow. Get Moving! A 7:30 am holiday workout has become part of my prep for one of my best friend’s annual 4th of July pool party. Riding the endorphin rush all the way to the party keeps me from negating my hard work by heading straight for the heavy foods. If I do go a little overboard (and I admit, I usually do), it helps knowing I burned some serious pre-splurge calories. However, if you’re the type who’ll use a pre-party workout as a license to go hog wild, adding some time to tomorrow’s workout may be a safer bet. Do NOT arrive hungry! This rule applies to any party at any time of the year, along with happy hour or a late dinner out. Eat as you normally would before heading to the party. Make an effort to have several servings of fruits and veggies in case there aren’t many to choose from among the burgers,hot dogs and mayo-rich salads. If you find your stomach is rumbling as you’re headed out the door, grab a piece of fruit or serving of almonds for the trip. Bring Some Healthy Grub! Be the health-conscious guest who shows up carrying veggie crudite with hummus or a fruit salad with non-fat Greek yogurt as a dip. If you’re great in the kitchen (unlike me!) you can even do something creative like scoop out the inside of a watermelon and then use the shell as a bowl for the fruit salad. For a dessert, why not bring a tray of individual servings of red and blue jello as non-alcoholic shots? Speaking of booze, don’t be shy about bringing lo-cal margarita mix or bottles of seltzer and diet sodas, including tonic water, to mix with vodka, gin or rum. At the end of the day, if you end up having that second hot dog or realize you’re the one who ate half the plate of seven-layer dip, don’t sweat it. Sometimes you have to be a little bad to get back to being good. So for today, have fun celebrating our nation’s independence and whatever you do, please remember to designate a driver. That’s the best way to ensure you and yours will get home safely and face tomorrow with a renewed spirit to have fun, be fit and feel fabulous! Posted on July 4, 2012, in Fitness, Health, Nutrition, Vacation and tagged 4th of July, BBQ, Healthy Eating Tips for 4th of July, Independence Day, Laura DeAngelis, Smart Grilling. Bookmark the permalink. 1 Comment.